Another spot on recipe! The pictures are beautiful and the lemon bars are making me salivate! Great job Veronica! Loving your blog. Lemon Bars sound so good right now. Definitely makes me think of summer! Veronica what a wonderful post, photos and recipe. I checked guest post at Chef Dennis and you did fabulous job! Found you on Chef Dennis's blog- these lemon bars look wonderful! I love lemon bars too. Thanks for posting! thank you so much for such an incredible guest post!! 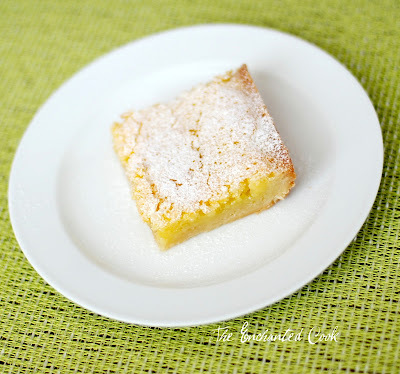 You brought some sunshine into my blog today with those gorgeous lemon bars! Your pictures of those lemon bars are breath taking! We need some sunshine here in Chicago Land:) Thanks for a great guest post on chef Dennis' Blog. Veronica, just read your guest post on chef D's blog. Thank you so much for such a wonderful lemon bar recipe. Found you over at Chef Dennis! Love those bars! I think I am going to try them this weekend! Great job Veronica! Your lemon bars look fabulous :) I just checked em out over at Chef's page too! They're beautiful, heading over to MTAMF now! a little plate of sunshine is right! cant wait to see your post! A little slice of sunshine right on your plate, most definatley. What beautiful photo's! Beautiful! I'm glad I found your blog from More Than a Mount Full. Beautiful post, i'm visiting from chef dennis and now following you too!! These DO look like a plate full of sunshine! I'll have to check out your recipe on Dennis' blog! A great and refreshing dessert for the winter! Veronica, these look fantastic! I love lemon bars, I will have to try this recipe very soon! I never get tired of lemon bars - one of my favorite flavors in any form! Love lemons and lemon bars...gotta try this one out! Congratulations on your top 9 post!!! thanks again for such a great guest post! What a classic dessert and such beautiful pictures. Awww they look so tasty!!! Such beautiful photos too! What kind of lens did you use for these? Yeah on being on Chef D, so cool Top 9 too, Congrats! i'm making these tonight I have some lemons are the counter begging for this! Have a great weekend, amazing pics. too! Hi Eva - I used a Nikkor 50 mm lens - it's my favorite! Gina - Let me know what you think! If you like an extra lemony punch, be sure to make the glaze, too! I love your photo - you are gorgeous! I have been craving lemon bars for about a month now, yours look delicious! Hi! Lovely blog you have here, thanks to Chef Dennis, I discovered your blog:D Love the lemon bars! So tempting! So, so very lovely. You've captured them beautifully. I made your lemon bars twice this weekend. I love how simple and fresh they are. Thanks for a great recipe I will turn to time and time again.